Fielding is a huge problem so far for the Miami baseball team. The Canes have committed 12 errors in their first four games. Four of those mishaps came during Wednesday night’s 5-2 loss to the Florida Atlantic Owls at Mark Light Field. Coach Jim Morris showed significant concern with the way his defense has kicked off the season. The biggest error of the night came in the top of the seventh inning. After the Canes (2-2) cut the FAU lead to 1 in the bottom of the sixth, Miami freshman pitcher Cooper Hammond faced Owls centerfielder Billy Endris, 0-for-2 at that point. With two outs and a runner at second, Morris oddly elected to walk Endris. The next batter, shortstop Stephen Kerr, hit an RBI double down the right field line. Catcher Garrett Kennedy then had Kerr in a game of pickle between second and third, but after nearly chasing Kerr back to second, Kennedy threw it away into the outfield, scoring Endris from third. Morris said it was a matter of righty versus righty in the seventh. Despite a .500 record, Miami’s pitching is racking up strikeouts; starter Javi Salas pitched six innings and struck out seven. Salas had a rough first inning, giving up a two-run homer to first baseman Ricky Santiago. An RBI single in the third by Tyler Rocklein put the Owls up 3-0. The Miami lineup sputtered through the first five innings. FAU starter Brandon Rhodes had a one-hitter with two outs in the sixth. 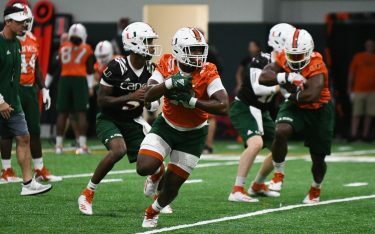 The top of the order, which has been Miami’s offensive mainstay one week into the season, came to life. Dale Carey and red-hot leftfielder Tyler Palmer hit back-to-back doubles, cutting the lead to 3-1. David Thompson, who walks up to Katy Perry’s “Roar,” had the “eye of the tiger” as he ripped an RBI single into center, which scored Palmer. Zack Collins, hitless so far this season, reached on an error to load the bases. The fans caught on to the rally as Brad Fieger stepped up with a chance to give the Canes a huge comeback lead, but it was not to be as he flew out to right. Miami put Carey up in the ninth with runners at the corners and two outs, but a swinging strikeout on three pitches ended the game. Morris still shows a great deal of confidence in his team early on. FAU moves to 3-1 with the win. The Owls have outscored Notre Dame and Miami 34-11 in their three wins this season. 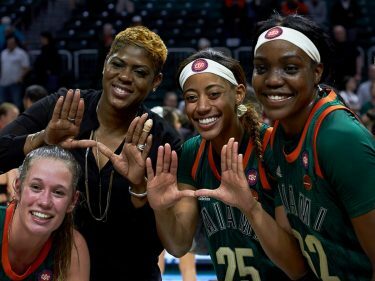 Miami takes on in-state rival Florida this weekend starting Friday night at 7 p.m. at the Light. Morris was adamant that the team needs to worry about their play rather than the weekend.